The eleven month miners’ strike, between March 1984 and March 1985, was Britain’s most significant political turning point of the last half century, and the nearest the country has come to civil war for 400 years. It marked the end of a way of life for hundreds of thousands of people as the legacy of Attlee’s reforming, post-war Labour Government, with its welfare state, strong trade unions and large public sector, morphed into Thatcher’s Britain. March 2009 will see the 25th anniversary of the strike beginning. 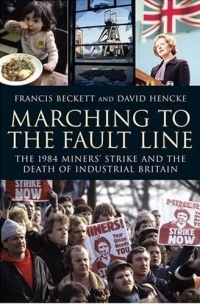 For that anniversary, distinguished journalists Francis Beckett and David Hencke are writing the definitive book about those events, telling the story based on unique access to new evidence, and offering an authoritative assessment of the strike’s central place in post-war British history. Marching to the Fault Line: The Miners’ Strike will trace the strike’s enduring emotional impact – shown by the extraordinary international success of the films Billy Elliot and Brassed Off – and will offer a gripping account of a dispute that split the nation, as the authors follow the story’s every twist and turn, from the secret enclaves of Downing Street to the seething picket lines. A lively, popular and informed account of the strike. The first attempt since its immediate aftermath to offer a full account of the strike itself. . . . [breaks] some useful new ground by exploiting the Freedom of Information Act and winkled out cabinet papers and Coal Board minutes to throw light on behind-the-scenes government manoeuvring.